Made with a bamboo rich fibre blend, and with added elastane, the low ankle HJ Hall Bamboo Cushioned Trainer Socks in this twin pack promote comfort, support and good skin health and hygene that is perfect for anyone in an active or sporting lifestyle who lives in trainers, or simply for wearing with shoes in summer for a ‘no socks’ look. 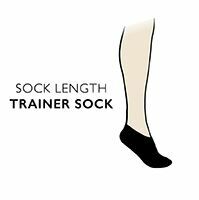 The liner-style trainer socks have a low scooped cuff, arch support band and terry loop cushioning from the underfoot to the toes. Bamboo provides natural anti-bacterial and hypoallergenic properties, along with superb moisture management and heat regulation for dry, healthy and fresh feet.